Born on May 6, 1929, in Lincoln County, NC, Harlan Boyles was the son of a farmer and grocer. Struck by polio as a teenager, Harlan spent a year in a Hickory hospital, finishing the 10th grade by correspondence. Junior Achievement He later attended the Univeristy of Georgia (1947-1948) and then went on to graduate from the University of North Carolina at Chapel Hill (1951) and then earn his Certified Public Accountant (CPA) designation in 1955. 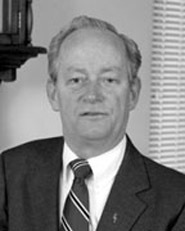 He joined the North Carolina State Revenue Department in 1951 as an auditor. In 1960, he moved to the State Treasurer's Office as Secretary of the Local Government Commission, which managed public debt and oversaw the finances of local government. That year saw North Carolina gain a Triple A rating from the nation's fiscal rating firms. For 16 years, Harlan was the right-hand man of State Treasurer Edwin Gill. When Gill retired in 1976, Harlan made his first political race, winning the State Treasurer's position and starting his six-term, 24-year tenure. Throughout Boyles tenure as State Treasurer, North Carolina maintained its AAA rating, which saved the state millions, if not billions of dollars. In addition, 25% of all local governments receiving AAA ratings are located in North Carolina when he retired in 2001. During Boyles five decades of public service, the North Carolina state budget rose from $400 million to $46 billion. As Treasurer, Boyles guided the investment of $70 billion in state and pension funds. Boyles received honorary degrees from Appalachian State University, Campbell University and Catawba College. He published a book on finances, and served as a guest univeristy lecturer. Among his many honors, Boyles was Public Official of the Year by Governing Magazine and Distinguished Service Awards from both the North Carolina Citizens for Business & Industry and the North Carolina Association of County Commissioners. The General Assembly of the State of North Carolina unanimously passed a special resolution memoralizing Harlan Boyles upon his death.